Today is John’s last day of school. He doesn’t have any actual lessons to teach, but has gone in to sort out files, tidy up and say goodbye to his colleagues. In the meantime, I am at home packing up boxes to be shipped to Switzerland. I have no idea how we managed to acquire so much stuff in one year. Most of John’s colleagues are flying home for the summer this weekend or early next week, so it has been a week of goodbyes. This is the reason we have managed to eat out every night since Sunday. On Monday we went to Taste, the same place we went for Christmas Dinner. The owner is a Kiwi (New Zealander, not bird) and the food is excellent. We went with Sarah, Steve, Lisa and Paul, some of the first friends we made here in China. Sarah, Steve, Lisa, John and I all went for hot pot dinner in the first few days of arriving in China when we were all still pretty overwhelmed and unsure what was going on. Of course, we are all experts now. 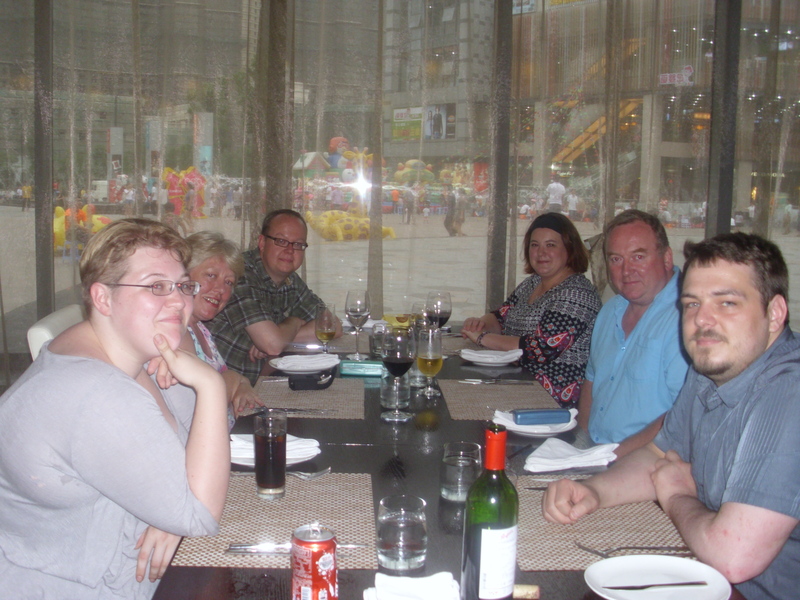 Lisa and Paul are staying in Wuxi, but Sarah and Steve have decided to try their luck in a new school in Qingdao. On Tuesday, we visited Mark who was staying on the 36th floor of an apartment-hotel in the city centre as he had moved out of his own apartment. He will be relocating to Dalian later in the summer with his wife, Yi Lin. It was great to get bird’s eye view of the city, although it was a shame the weather was so hazy. Afterwards, we went to a tappenyaki restaurant at the top of the Great Eastern department store. The food is cooked in front of you by the chef, great in theory, but frustrating when you have to wait for the group next to you to get their food before your food is cooked. On Wednesday, I had my last Chinese lesson with Grace. She is moving to Shanghai in the summer to start work in the international department of a high school. After my lesson, John joined us for lunch at a Hong Kong restaurant that serves the best steamed shrimp dumplings in town. It was good to sit and chat. Grace has been a good friend to me. As well as teaching me the language, she was the person who taught me how to get around the city on the bus and showed me where the interesting places are. It has been invaluable having inside information. After lunch, John played in a staff v students football match. Yes, you did read that correctly – John played football (for the first time in about 20 years). When the students came on looking young and fit in their matching kit, I thought the teachers would be thrashed. In fact, the teachers won 1-0. A good example of age and experience coming top. The playing/ watching football made us thirsty so afterwards we went to HBO, a bar not far from the school, for beer and burgers. Last night, the headmaster of the school invited all the foreign teachers (and spouses, luckily) to a meal at an Italian restaurant in the city. The food there is delicious, but the service is a bit random. Many main courses arrived before starters and I ate half someone else’s dinner before being given what I ordered. Never mind, it’s good to share. So after all the goodbyes and packing today, we will just need to decide where to eat tonight – we have no choice now I have packed the wok. Wuxi is a small city by Chinese standards (about 5 million people) with a relatively small non-Chinese population. Therefore, whenever we leave the house we are the subject of interest for other people. This is usually benign and can consist of staring and saying ‘kankan waiguoren (look foreigner)’ or even requests for photos. As a naturally grumpy person, I hate it and have developed a whole new range of hard stares (to add to my already impressive repertoire). I don’t mind people who actually talk to me and ask where I am from etc., especially if they ask in Chinese (thus giving me speaking practice), but the people who just stare make me feel a bit like a zoo animal. On the other hand, John doesn’t mind at all. Anyone who stares at him gets a friendly wave and ‘ni hao’, all photos posed for and requests for help with English grammar granted without a moment’s hesitation (although, as John teaches maths, not English, his advice might not always adhere to standard rules). 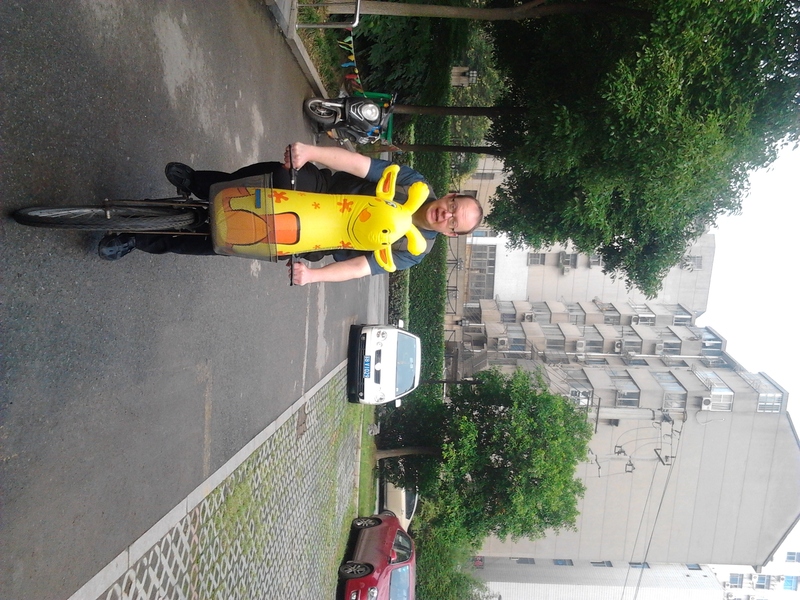 So, does this explain why John cycled to work with a Giraffe today? 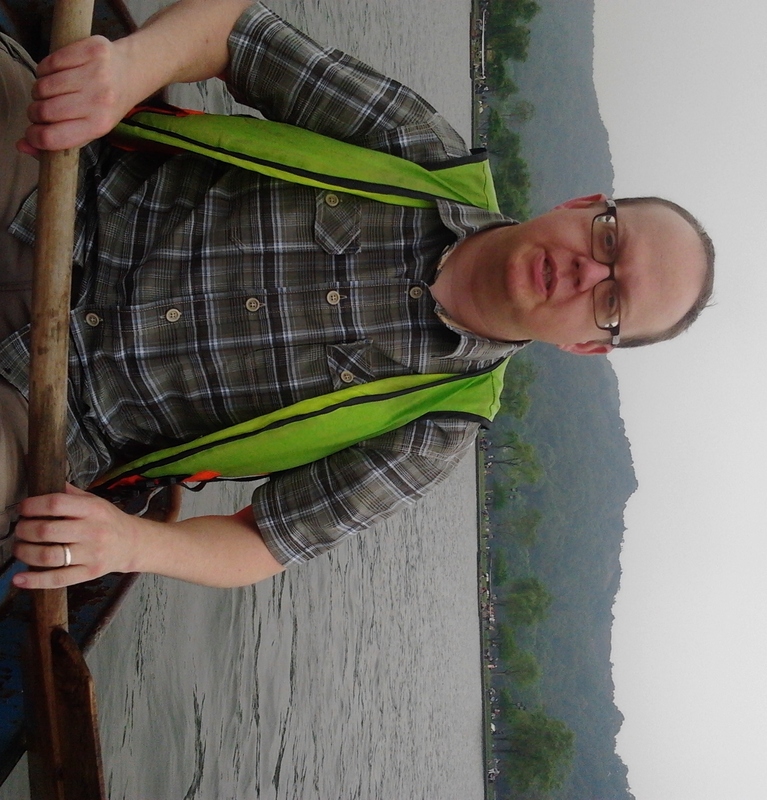 Last week, we had a really good couple of days in Hangzhou. I am not sure that it is paradise on Earth, but it is very pretty. It is about 2 hours from Wuxi by high speed train and its close proximity to Shanghai makes it a really popular place for Shanghai folks to escape to for the weekend. Luckily, John had a couple of days off work, so we were able to visit on Thursday and Friday rather than at the weekend. There is a Chinese idiom ‘人山人海’ (Ren Shan Ren Hai) which literally means people mountain people sea – a perfect description of Chinese scenic spots on the weekend. Accommodation is pretty expensive, but as we are planning to stay in youth hostels when we visit Yunnan in the summer we thought we would have a trial run. The hostel was lovely. We had an ensuite, double room. The bed was a bit hard, but all in all it was great. The best part was the location. It was just off Hefang Lu which is a pedestrianised street full of shops selling snacks and souvenirs and only about 15 minutes walk from the West Lake. The West Lake (西湖 XiHu) is the reason Hangzhou is so popular. It is not as big as Tai Hu near Wuxi, but it is much more attractive. We took a boat trip to an Island in the middle of the lake then on to the Louwailou restaurant on the lake shore for lunch. I was especially keen to go to this restaurant as it had a starring role in one chapter of my Chinese textbook (the main character, Mark, visits Hangzhou and meets an informative taxi driver). For lunch we had West Lake Vinegar Fish (西湖 醋鱼 XiHuCuYu), which is one of the typical Hangzhou dishes (another is beggars’ chicken – chicken cooked in mud, which is smashed at your table). To be honest I wasn’t very keen on the fish, but it was good to try it in the authentic location. Afterwards we took a rowing boat out on the lake, which was a bit hard work for a relaxing break. We had a paddle each and as John is a lot stronger than me, we spent some time going around in circles and crashing into other boats. Back on dry land we were just in time to see the spectacular fountains which ‘danced’ in time to the music. Very impressive. In the evening we shopped for souvenirs (tea and old-style propaganda postcards) and visited the food street. There were stalls selling every kind of snack, from tasty kebabs to scorpions and the ubiquitous stinky tofu (it really stinks – like stinky cheese gone bad). One man tried to tempt us by shouting snake at us in English, but I thought that is a treat I could happily live without.